﻿Orthodox New Year's Day: Calendar, History, Tweets, Facts & Activities. Orthodox New Year is celebrated as the first day of the new year as per the Julian calendar. Orthodox New Year is a celebration of the year to come. It is often referred to as Old New Year, and is celebrated by Orthodox churches in Russia, Serbia, and other Eastern European countries on January 14. Although most countries have adopted the Gregorian calendar, where New Year's Day is January 1, the Orthodox Church still follows the Julian calendar, which places Christmas on January 7 and New Year's a week later. Russian Orthodox churches in the United States hold church services often with festive dinner and dancing to celebrate the holiday. The traditional dishes include meat dumplings, beet salad, pickled mushrooms, tomatoes, and cucumbers along with vodka. Orthodox Serbians also celebrate Old New Year, which is sometimes called the Serbian New Year. Many Serbians Orthodox churches hold services, followed by dinner, and dancing. 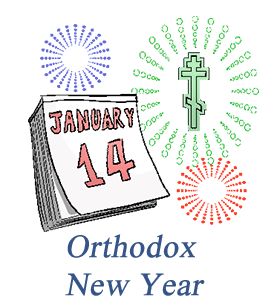 Although the Old New Year is a popular holiday for many practicing the Orthodox faith, it isn't an official holiday. Macedonians, including those living in the United States, also celebrate Old New Year's with traditional food, folk music, and visiting friends and family. Many Russians enjoy extending the holiday season by including Orthodox New Year in it. Enjoy a dinner dance at Orthodox church with native cuisine folk music. Learn to cook some Russian or Eastern European dishes. One of the most important Russian dishes during the holiday season is kutya, a porridge made of grain, honey and poppy seeds. It symbolizes hope, happiness, and success. Rent a movie Dr. Zhivago (1965). It depicts some of the lavish parties held during the holidays right before the Russian Revolution. The film is based on the 1957 novel by Boris Pasternak.